1780 was a monumental year in the history of the Austrian Netherlands. Duke Charles, the much loved governor, died in that year. He expired in Tervuren, near Brussels, but in the same year, in the true seat of power, Vienna, Empress Maria Theresia, also died. Her son and successor Joseph II energetically proceeded to reform the Netherlands into a modern state, entirely according to his ideas informed by the Enlightenment. He personally travelled to the Netherlands to become acquainted with the situation. He was so displeased with what he found that he felt compelled to introduce his reforms immediately. This had a deleterious effect on the Belgians as they thought the changes were much too rapid. 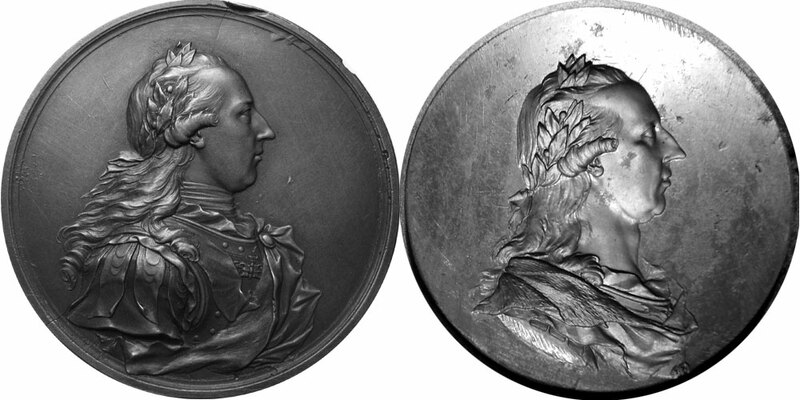 Incomplete work with the portrait of Emperor Joseph II, made immediately prior to the Brabant Revolution. The relationship between ruler and the ruled had deteriorated to such an extent that the province of Brabant refused to pay any taxes. The other provinces of the Southern Netherlands also rebelled quite openly against their lord. Riots broke out and patriotic societies were created. By the end of 1789 an open confrontation resulted and in January 1790 the Austrian regime was expelled and the United Dutch States were proclaimed. In the end Emperor Joseph II lost out, the Brabant Revolution was the last straw. Shortly after the proclamation of independence, he died on the 20th February 1790. The Brussels’ Mint in the eighteenth century. Van Berckel was not just a spectator of these turbulent events. He was involved in several different ways. The general feeling in the capital of Brabant will, no doubt, have been anxiety. On his daily walk from his home to the mint, he might have witnessed disturbances. Maybe he was seen as an accomplice of the Austrians and called names by the rabble. He was, after all, employed as civil servant by the hated government. Be that as it may, he remained in his position and worked on new dies with the portrait of Emperor Joseph. Some dies from this last year of Joseph II were unfinished, possibly as a result of the start of the revolution. After the Austrian troops had left the Netherlands, something extraordinary happened. The new government could avail itself of almost the whole of the civil service of the old regime. 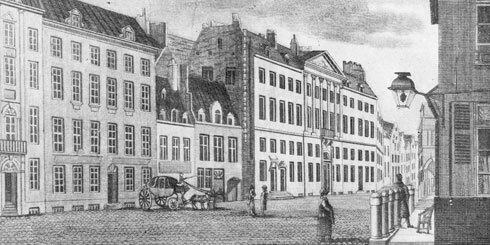 The civil servants of the mint in Brussels, including the General Engraver Van Berckel, laboured on as if nothing had happened. 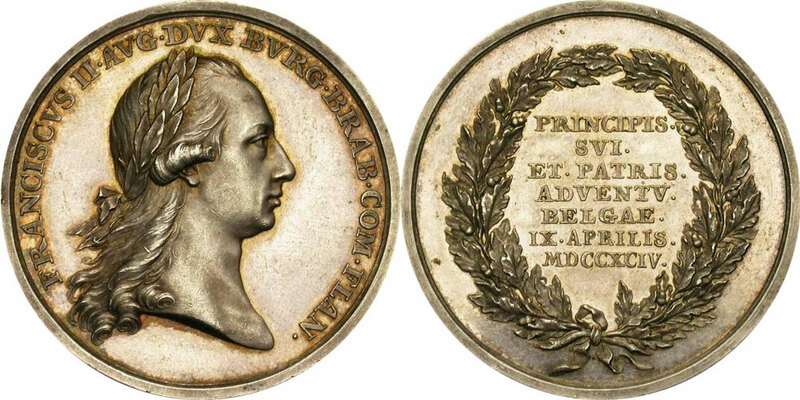 Van Berckel was ordered, shortly after the departure of the Austrians, to make dies for the coinage of the new state. The first dies were ready in a very short space of time. Production of copper coins of 1 and 2 oord was started immediately, followed by silver coins of a half and a whole guilder. Coins were produced so quickly that a fairly large number of silver was already struck when it became obvious that the intended legend for them was incorrect. 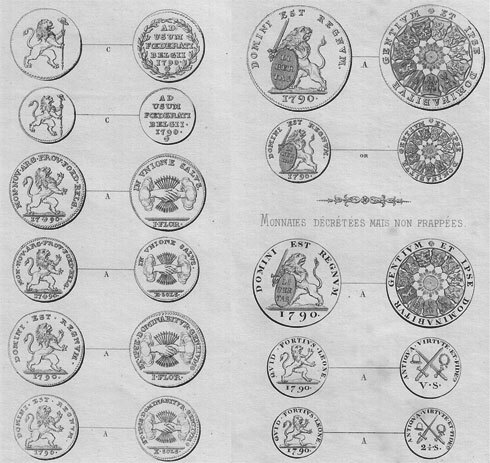 Summary of the coins for the United Dutch States. The first 8 of these coins (left to right) were actually struck. Van Berckel could not be blamed for the failure of the establishment of a separate state for the Belgians, after all he had done his job. He had cut dies, in very short time, for a total of 6 new coins. In reality it was 8 new coins, counting the variants of the 10 stiver piece and the florin. He had also re-organised the coinage process, in an efficient way, so that in a few months a large emission was achieved, unprecedented for the time. If it hadn’t been for the delays caused by erroneous instructions from the government, it is probable that all 9 coins would have been achieved within a year, including their production. 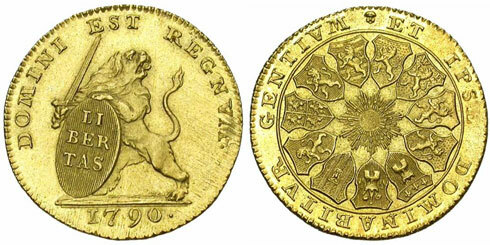 Gold coin of 25 mm. with a weight of about 8.3 gm. and a value of 12 guilders. Emperor Leopold II took control without ever setting foot on Dutch soil. The governor couple again took on ruling the Southern Netherlands as his representatives. The question remains why, for as far as is known, there were no repercussions for Van Berckel and, for that matter, the entire mint workforce. 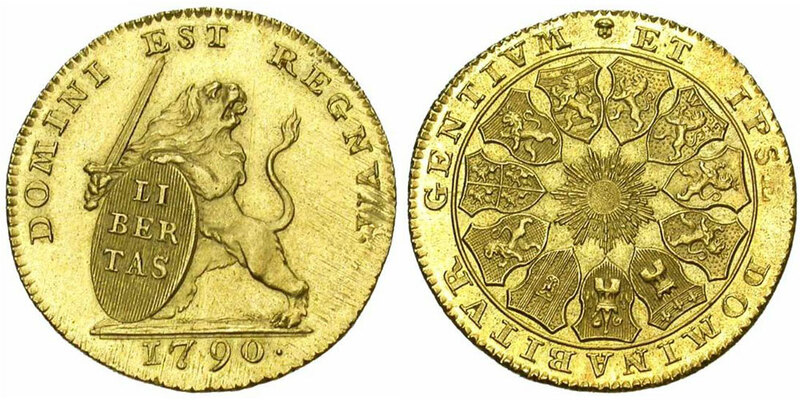 In fact the Mint of Brussels had been guilty of treason by coining for the new government. Maybe the answer is that the promised amnesty ensured that no one was punished. Instead, Theodore van Berckel could be assured he still enjoyed the favour of the Habsburgs. 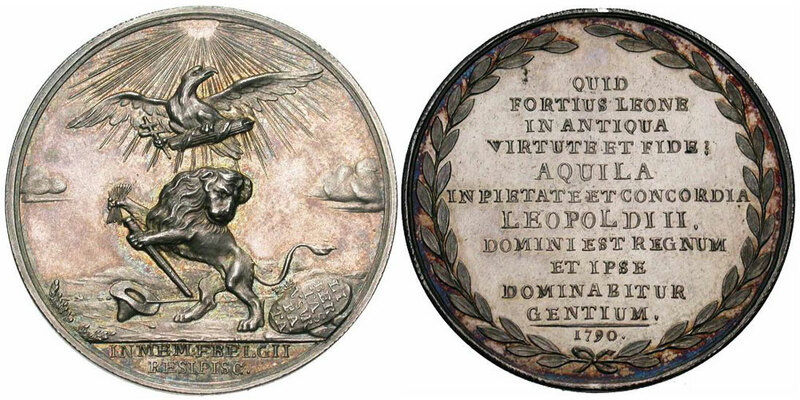 We know of one derisory medal, struck at the time, that shows the symbols of the freedom of Brabant trampled on the ground and shows the Austrian Eagle overcoming the Brabant Lion. The maker of the medal is unknown but we can exclude Van Berckel as its engraver. The Austrian Eagle overcomes the Brabant Lion. Now that the Austrians were back in charge, Van Berckel could start on a series of inauguration medallions, medals and coins with the portrait of Leopold II. Van Berckel never met the emperor and was probably working from state portraits and busts. We know that Leopold acted with much more patience and tactfulness in the Netherlands than his predecessor had done. Nevertheless, his rule only lasted a short while, as he died suddenly on the 1st March 1792. 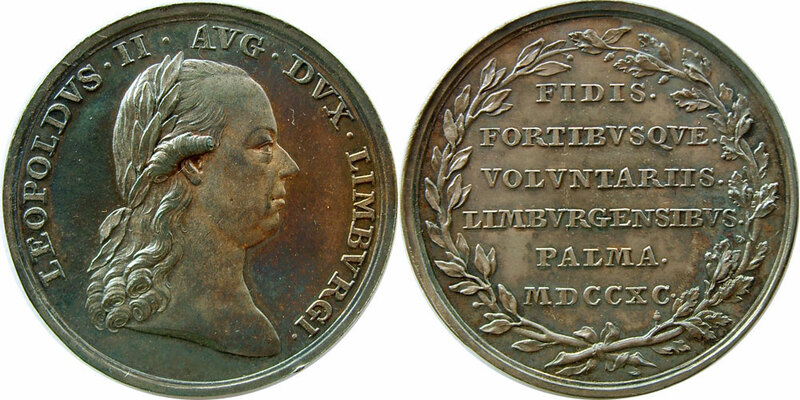 Commemorative medal for the Limburg homeguard which had helped facilitate the return of the Austrians. Leopold was superseded by his elder son, who ruled under the name of Francis II. 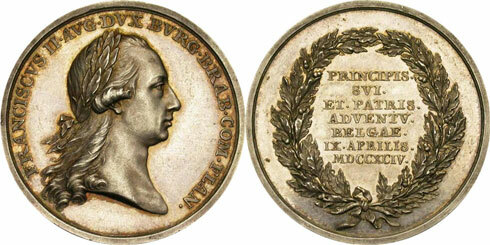 Van Berckel produced all dies for this new emperor too and a large volume of new medals and coins were struck. However, the days of the Austrian Netherlands were coming to an end. In 1793 the French armies started moving north and in June 1794 the French were at the gates of Brussels. It was soon clear that their force was overwhelming and the government decided to evacuate. The government, the army and the civil servant too were ordered to prepare everything for an eastward evacuation. Non-Austrians had the choice of staying at home, but that meant automatic resignation. Van Berckel decided to travel along to Austria, with fateful consequences that became apparent later. Foto: Photo: Jean Elsen, Brussels.